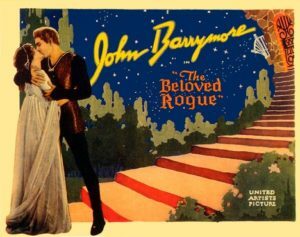 The Beloved Rogue is a strange one: it’s ostensibly based on events from the life of the first great poet of the French language, François Villon (1431-1463) –a man whose life we know next to nothing about, and what little we do know doesn’t exactly support this movie’s story. About the only thing they got right is that the great poet was also a petty criminal, a thief and ruffian who frequently ran afoul of the law. But this film is no bio-pic, it’s more a romantic fable of the Middle Ages, so maybe the facts don’t matter. We know we’re in fable territory from the very first scenes set in a medieval Paris deep in the grip of winter, the city’s crazy gambrel roofs covered in snow and dripping with icicles. (The exaggerated sets are by William Cameron Menzies, who also did The Thief of Bagdad.) Villon, who enters the film in mid-robbery, stealing a jug of frozen wine, is played by John Barrymore, who gives his daring rogue a devil-may-care insouciance lacking in Douglas Fairbanks’ earnest heroes. Barrymore switches back and forth from heartthrob to buffoon without hesitation, always three sheets to the wind, and as the King of Revels on All-Fools’-Day, he clowns like he just don’t care. Already famous for his poetry, darling of both the beggars and the nobility, Villon gets caught up in a political struggle between King Louis XI and the Duke of Burgundy, who wants the throne. The poet writes scathing satirical doggerel skewering both king and duke, romances the king’s adorable ward, dodges death and exile, and engages in assorted drunken shenanigans involving a catapult, a performing bear, a capering dwarf, Burgundian crossbowmen, and an army of beggars from the Court of Miracles. Barrymore’s Villon is a blond Byron who does all his fighting with his words and his wits, winning the day through sheer cleverness. But the impish Villon doesn’t own this picture, he has to share it with King Louis XI, the master conniver of his day, played here by the great German actor Conrad Veidt (in his first Hollywood role) as a saturnine vulture, alternating between cruel gloating and cowardly cringing. It’s a bravura performance that even overshadows Barrymore’s in the scenes they share. There’s also some fairly daring direction for the day from Alan Crosland, who shoots at unusual angles, splits an image tenfold through a mullioned window, and employs long takes dwelling on Barrymore’s features as he has an inspiring idea or comes to a horrified realization, his every thought written clearly on his face. Good stuff.